Love it, love it, love it. 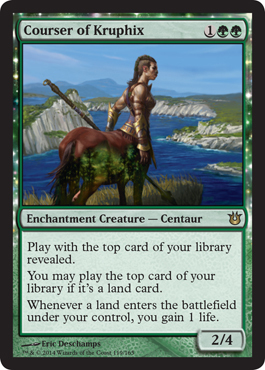 It's already a 1/1, but chances are you have more creatures and enchantments. This will be a good White Weenies deck or Boros tokens deck. I mean, why not? You have the creatures, you'll have a few Auras (yeah, no global Enchantments guys... Gods are creatures when their devotion is high enough, but only if it is kept above the threshold number. After that, they're only a global enchantment, not an Aura.). 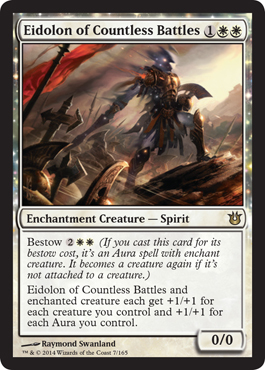 Costly, but if you ramp or the game lasts a while, you have a creature that is indestructible AND you can scry 2 if it's your turn. 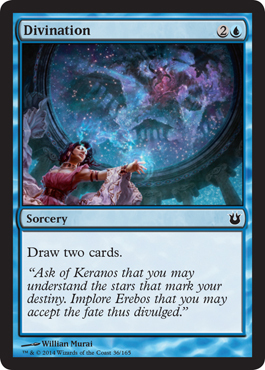 So, this is Modern and Legacy good. Dredge. Cast this, bring back any giant thing you dropped. 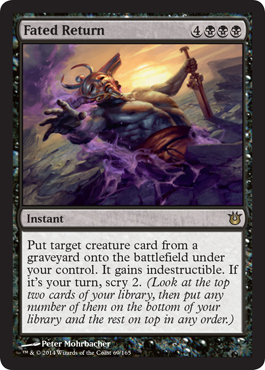 And if you can do a turn 1 Griselbrand in Legacy, I'm sure there has got to be a good use for this in other formats, if not Commander. Love it. Promotes red devotion and you get big stuff hitting your opponent. Couple it with any stuff that was released that I said would be good for Red Deck Wins and you're good. One last time... Spoiler List is full and complete. Please enjoy some shenanigans with the new cards on Monday. Until then!